A storyboard is a written or graphical representation of the all of the elements that will be included in a short film. The storyboard is usually created before actual work on creating the film begins and a written description and graphical depiction of the elements of the story, such as images, text, narration, music, transitions, etc. are added to the storyboard. The elements of the story are arranged in the storyboard in the chronological order in which they will appear in the story and this allows the developer to organize and re-arrange the content for maximum effect. Creating storyboards is an often overlooked component and may seem like a tedious extra step. However, storyboarding can be a valuable component in the creative process by allowing the developer to organize images and text in a blueprint fashion before the development begins. Storyboarding can also inspire new ideas as well as lets the developer rearrange existing resources before the final development begins and changes may be harder to make. Storyboards may be created in a variety of ways, both digitally and manually on paper or artists’ board. If storyboards are developed on a computer, a variety of software programs may be used, such as Microsoft Word, Excel and PowerPoint. Make sure your storyboard progression is logical and coherent. Even if your video is a “who-done-it?” your audience expects a logical progression to a conclusion. Although plot-twists are exciting, stories that draw conclusions from nothing are neither informative nor enjoyable. 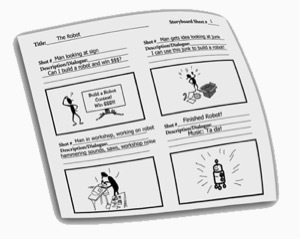 When creating a storyboard the images can be simple sketches, or images from your own resources or found on the web. One of the things you can do to help organize your digital story is to write your script out by scene on Post-it notes or index cards. This will help you arrange your scenes and dialogue so that your video flows in a coherent, logical manner. Once they are organized, number them and place them the order in which they will appear in the story. The frames of your storyboard will represent the images or scenes that take place. These frames will correspond to the order of your notes or index cards. After you download one of the storyboard templates, type or paste in a description of the images that will appear, the sound or narration that will be included, any music that will be playing, and any transitions or special effects that will be used for each frame or scene of your digital story. You can use thumbnail images of the photos you have taken with a digital camera or downloaded from the web, still image captures from a video, sketches you have hand drawn and scanned, or images you have found on sites like freeimages.com to represent the final images that will appear in your digital story.